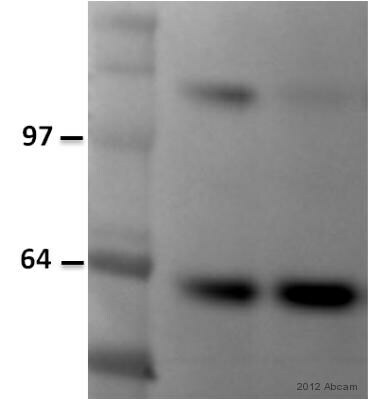 Recombinant full length protein, corresponding to a region within amino acids 737-927 of Human CTBP2 (NP_073713). Our Abpromise guarantee covers the use of ab96107 in the following tested applications. WB 1/500 - 1/3000. Predicted molecular weight: 106 kDa. Corepressor targeting diverse transcription regulators. Functions in brown adipose tissue (BAT) differentiation. Isoform 2 probably acts as a scaffold for specialized synapses. Ubiquitous. Highest levels in heart, skeletal muscle, and pancreas. Belongs to the D-isomer specific 2-hydroxyacid dehydrogenase family. Isoform 2 is phosphorylated upon DNA damage, probably by ATM or ATR at Thr-179; Ser-181 and Ser-185. 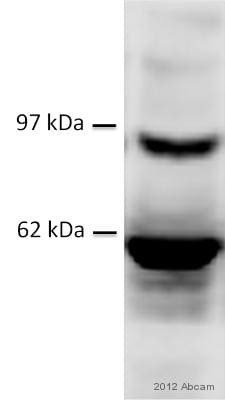 Phosphorylation by HIPK2 on Ser-428 induces proteasomal degradation. Nucleus. Cell junction > synapse. Immunofluorescence analysis of paraformaldehyde-fixed HeLa, using ab96107 at 1/100 dilution. ab96107 has not yet been referenced specifically in any publications. Publishing research using ab96107? Please let us know so that we can cite the reference in this datasheet.